Fang Fenghui arrives in the U.S. today, returning Martin Dempsey’s visit to Beijing last year. Against the backdrop of turmoil the South China Sea, a high-ranking Chinese military official is headed to the U.S. for a visit. General Fang Fenghui, the Chief of the General Staff of the PLA, will arrive in the United States Tuesday. 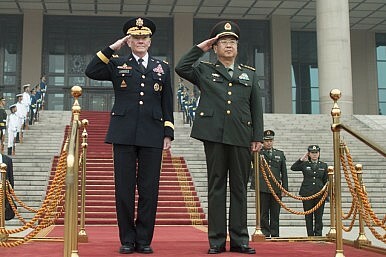 Fang’s visit come a little over a year after his U.S. counterpart General Martin Dempsey, Chairman of the Joint Chiefs of Staff, visited Beijing. According to the U.S. Department of Defense Press Secretary John Kirby, Fang’s visit will begin in San Diego. Fang “will be hosted by the U.S. 3rd fleet” during this leg, and will tour several U.S. vessels, including the USS Ronald Reagan aircraft carrier. Earlier this year, Defense Secretary Chuck Hagel was given a tour of China’s lone aircraft carrier, the Liaoning. Fang’s tour of the Ronald Reagan continues the theme of reciprocity underlining his visit to the U.S. Fang will also see a U.S. Marine Corp recruitment depot in San Diego. After leaving California, Fang will spend Thursday at the Pentagon for meeting s with Dempsey. Kirby promised a joint press conference by both Dempsey and Fang, which should be interesting given the confrontational nature of last month’s press conference with Hagel and Chinese Defense Minister Chang Wanquan. That press conference saw Hagel and Chang trade barbs over the U.S. alliance with Japan as well as the U.S. role in the South China Sea disputes. Given the current media attention on clashes between China and Vietnam near the Paracels, we could see another outburst of fiery rhetoric about who is to blame for stirring up tensions in the region. Fang will travel from DC to Fort Bragg, North Carolina for a visit to U.S. Army Forces Command. China Daily reported that Fang would be the first Chinese officer to visit Fort Bragg. Fang’s last stop will be in New York, where he will attend a final round of meetings before returning to China. During last year’s trip to Beijing, Dempsey met with President Xi Jinping. However, Kirby gave no indication that Fang will meet President Barack Obama during his trip, which might be taken by Beijing as a slight. While there are many potential pitfalls for this visit, there’s also reason for optimism. During last year’s meeting, Fang and Dempsey were far more positive in their remarks to the press than either Chang or Hagel were last month. In part this may be due to the timing, but it also reflects the personalities of the men involved. The U.S. military leaders I’ve spoken with see Fang as a reasonable voice willing to engage the U.S. There are similar perceptions of Dempsey within China. Both men were given opportunities to harangue each other in their press conference last year (including questions on cybersecurity and the U.S. “pivot to Asia”) but neither took the bait. Accordingly, Fang’s visit will be an interesting change to gauge whether last month’s hostile press conference was an aberration or the new normal for U.S.-China military-to-military relations. Mutual suspicion and distrust between the two militaries is nothing new, but at previous high-level interactions both sides were at least willing to put on a positive face. With the media certain to ask pointed questions about the South China Sea and other issues, Fang’s visit will be a test of the waters for U.S.-China mil-to-mil ties. During a press conference with Martin Dempsey and Fang Fenghui, South China Sea issues dominated the discussion.